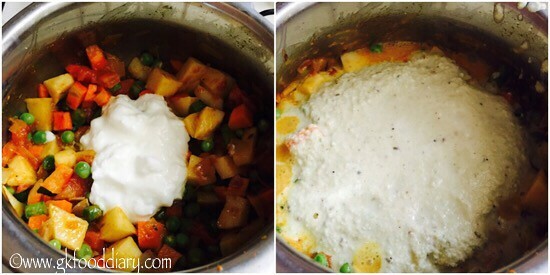 Vegetables Kurma – Easy, quick, one pot vegetables gravy made with pressure cooker. 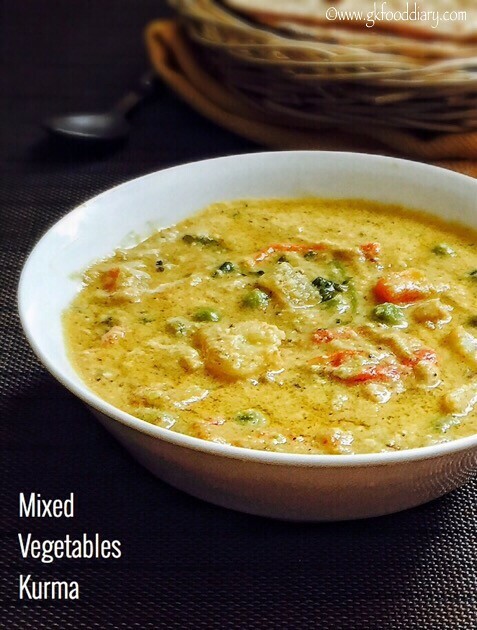 This mixed vegetables kurma is my moms signature recipe and it’s everyone’s favorite at home. My mom makes this veg kurma at least once in a week, it goes well with chapati/roti or parathas. 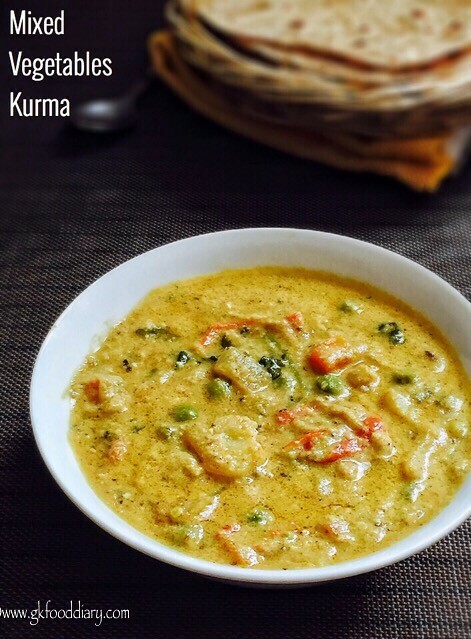 You will be surprised once you try this vegetables kurma as it’s very tasty, also its a best way to make sneak in some vegetables to your kids diet if they are fussy about eating vegetables. 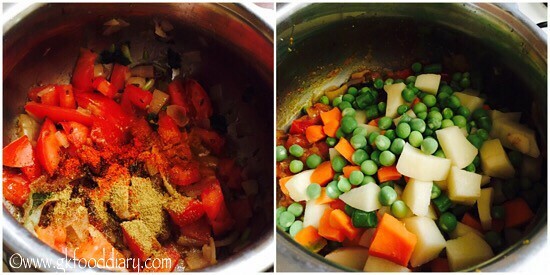 Here is how to make easy vegetables kurma recipe for toddlers and kids . Slice onions, chop tomatoes finely. Slit green chillies. Roughly chop mint & coriander leaves. Set aside. Wash all vegetables and cut into bite size pieces. 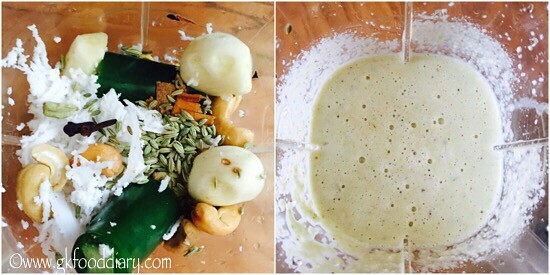 Take the items given under to "grind" in a blender. Grind everything with little water to a smooth paste. Heat a pressure cooker with oil. 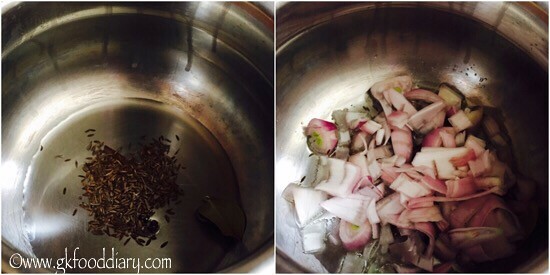 Add bay leaves & cumin seeds. Fry for a minute and then add onions. Saute them nicely until golden brown. Once onions becomes transparent, add tomatoes along with turmeric powder, red chilli powder and garam masala. Fry tomatoes until the raw smell of tomatoes & spice powders leaves and tomatoes become mushy. Now add the chopped vegetables along with kasoori methi, mint & coriander leaves. Saute them nicely until the masalas are coated well with veggies. Now add curd and mix well. Then add ground masala paste and required salt. Give a quick stir. Add a cup of water and bring it to a boil. Pressure cook the vegetables for 2 whistles. Open the cooker once the pressure released. Simmer the gravy until it becomes thick if required. Switch off the flame once done and add a tsp of ghee. 1. 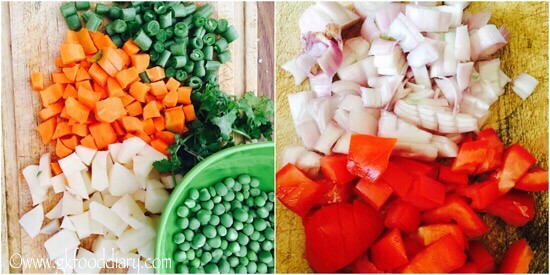 Slice onions, chop tomatoes finely. Slit green chillies. Roughly chop mint & coriander leaves. Set aside. Wash all vegetables and cut into bite size pieces. 2. Take the items given under to “grind” in a blender. Grind everything with little water to a smooth paste. 1. Heat a pressure cooker with oil. Add bay leaves & cumin seeds. Fry for a minute and then add onions. Saute them nicely until golden brown. 2. Once onions becomes transparent, add tomatoes along with turmeric powder, red chilli powder and garam masala. Fry tomatoes until the raw smell of tomatoes & spice powders leaves and tomatoes become mushy. Now add the chopped vegetables along with kasoori methi, mint & coriander leaves. Saute them nicely until the masalas are coated well with veggies. 3. Now add curd and mix well. Then add ground masala paste and required salt. Give a quick stir. 4. Add a cup of water and bring it to a boil. Pressure cook the vegetables for 2 whistles. Open the cooker once the pressure released. Simmer the gravy until it becomes thick if required. Switch off the flame once done and add a tsp of ghee. 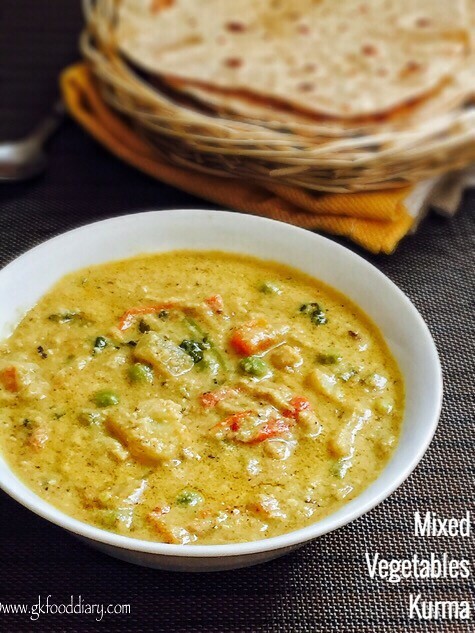 Serve the vegetables kurma with roti/chapati or parathas! Tastes yum!!! Instead of curd you can add a tsp of lemon juice at the end. 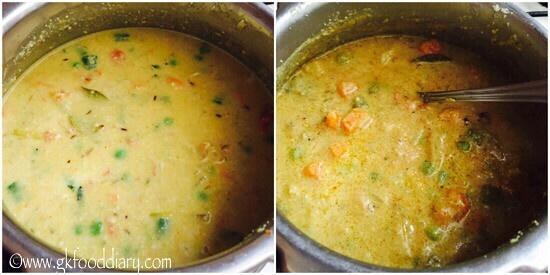 Adding a tsp of ghee afrer pressure cooking gives a nice flavour to the kurma. Don’t skip it. Increase red chilli powder for the spicy kurma. 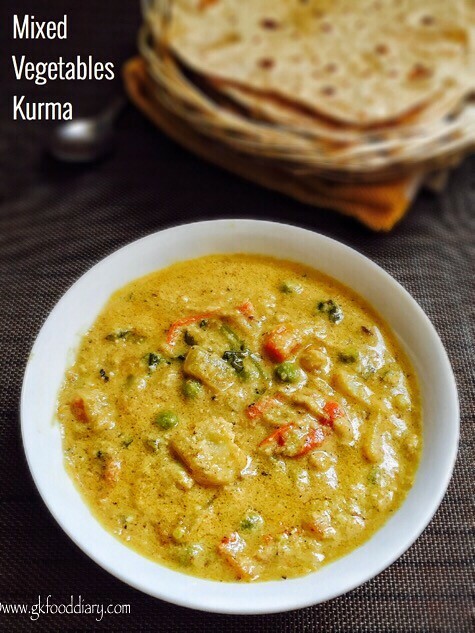 Make sure to introduce each vegetables separate and removed allergens before you try this vegetables kurma.